The Creative commons-licenses (latest version 4.0) have become a standard for open publishing and determining the subsequent use of an open access work. In CC-licensing the copyrights of the work remain with the author. For open software there are also MIT- and GNU-GPL-licenses, among others. In all cases of sharing and determining the subsequent use, the following rule applies: If a natural person in the interview material can be identified, the person should be anonymized before sharing. In general, the University of Helsinki recommends CC BY -license for sharing publications, unless there are other recommendations by the publisher. You can find out about the different licensing policies on the journal’s or publisher’s websites. Note that once you have chosen a license you cannot change it any longer. In Self-archival (the Tuhat-database) you can choose the license for your articles and other research documents in the archival form, part “Upload an electronic version > Access to electronic version > License (see the picture on the left). For sharing of research data The University of Helsinki recommends CC 0 -license, where the author gives up all copyrights in order to advance open science. It has to be noted, however, that when material is used in research, the guidelines on good research practice should be followed, that is, the sources and authors should be named. Sharing source code is a more complicated issue. It is recommended to read up on different licenses used with source codes (for example, Morin, Andrew, Urban, Jennifer & Sliz, Piotr, A Quick Guide to Software licensing for the Scientist-Programmer. PLoS Comput Biol 8(7): e1002598. 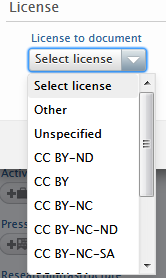 and then to choose a suitable license for the source code in question. After this, it is advisable to clear the ownership of the code from Research services or by contacting datasupport@helsinki.fi. CC BY is the most popular license for open publishing. The license requires that others who use your work in any way must give you credit the way you request, but they can share your work and modify it freely. The text can also be translated. The CC BY –license enables maximum distribution, long-term preservation independent of publishers and utilization for digital research such as data mining. The use of the license is also recommended by the University of Helsinki Principles of Open Publishing, by Open Science and Research –iniative of the Ministry of Education and Culture and by several funding institutions, such as Horizon 2020 –iniative of European Commission. It is also used by many publishers, such as Springer. Sharing research data is a bit different from sharing publications, because the ownership has to be cleared before sharing, and subsequent use (such as data mining) is facilitated by a maximally open license. Therefore giving up the copyright (CC 0-license) is recommended for sharing research data and metadata. Previous versions (before 4.0) of the Creative Commons –license are not recommended for sharing research data. Below are the most important Creative Commons –licenses. Practical examples of their use can be found here in Creative Commons-webpage. The work can be copied, distributed, performed and modified freely, also for commercial purposes. 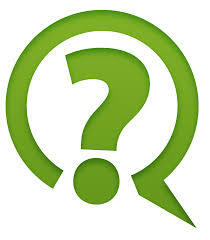 The name of the author must always be mentioned properly and the name, photo or logo of the author cannot be changed. CC BY is the most popular license for open publishing and it is extremely effective in reaching a lot of readers or wider public. For example, material shared with CC BY –license can be used in teaching, provided that the author is named. The work can be copied, distributed, displayed, performed, and modified, as long it is distributed on the same terms. If the work is distributed or modified under other terms, permission for that must be obtained first. This license is common in joint productions, such as Wikipedia. It is recommended for teaching materials. The work can be copied, distributed, displayed and performed, but the work cannot be modified in any way. Modifications of the work require a permission from the author. This license is often used for sharing works of art. The work can be copied, distributed, displayed, performed, and modified, but the work cannot be used commercially unless a permission is obtained from the author. The copyright law in Finland does not determine what is commercial use and the person using the works has to consider each case separately (for example, a work with this license cannot be shared in a commercial or advertise-funded blog, webpage or repository). CC BY-NC –license is recommended only in special cases, such as when the work would probably be utilized for commercial purposes and the author wants to prevent this. The work can be copied, distributed, displayed, performed, and modified only for non-commercial purposes, as long it is distributed on the same terms. This license is often used for learning materials (for example, in MIT). The work can be copied, distributed, displayed and performed, but the work cannot be modified in any way. In addition, it cannot be used for commercial purposes. This license has often been used for works such as audio books, podcasts and works of art which are hoped to have a maximum distribution, but exactly in the same form as the original work. The author waives all interests that may exist in his or her work worldwide (good scientific conduct presupposes attribution, however). Flickr-image service, for example, uses this license and it is recommended for sharing research data and metadata to promote open science.